This article is a special feature authored by the Centers for the Disease Control. Each year thousands of adults in the United States suffer illness, are hospitalized, and even die from diseases that could be prevented by vaccines. People with heart disease are at higher risk for complications from certain diseases. Take steps to ensure that your patients stay up-to-date with recommended vaccines so that they have the best protection against vaccine-preventable diseases that could be serious, and sometimes deadly, for them. People with heart disease are at high risk for developing serious complications from influenza. In fact, among adults hospitalized with laboratory-confirmed influenza, cardiovascular disease is the most common chronic condition. Research indicates that influenza vaccination reduces the risk of acute coronary syndrome and cardiovascular disease-related deaths. Make sure your patients get influenza vaccine every year to protect them from this common illness. People with heart disease are also at increased risk for invasive pneumococcal disease, including pneumonia with bloodstream infection. Pneumococcal vaccines can help protect your patients against severe disease from pneumococcal infections. Inflammation, such as that caused by infections, is thought to play a major role in coronary artery disease. That is why it is critical that your patients get these and other routinely recommended vaccines, like zoster (shingles) vaccines if they are 60 years or older, Tdap (tetanus, diphtheria and pertussis) if they have not had a dose before, and Td booster vaccine every 10 years. Other vaccines may also be needed based on vaccination history and other risk factors. 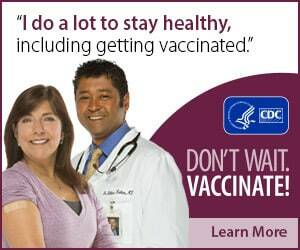 For the latest recommended adult immunization schedule, visit www.cdc.gov/vaccines/schedules. The recently updated Standards for Adult Immunization Practice call on all healthcare professionals to take steps to ensure that adults are fully immunized. Patients rely on you to advise them about important ways to protect their health. In fact, a recommendation from a provider is the most important predictor of a patient getting needed vaccines. Even if you don’t stock certain or all vaccines, it is critical that you routinely assess patient immunization status and strongly recommend vaccines that are due. If you don’t tell them about the vaccines they need, they are unlikely to get vaccinated. For vaccines you don’t stock, refer patients to another provider who can vaccinate. There is an expanding network of immunization providers; check http://vaccine.healthmap.org to find one in your local area. Remember to follow up at the next visit to confirm that your patients received recommended vaccines. Documenting the vaccines your patients receive, whether you administer them or not, is the best way to make sure your patients are up-to-date on their vaccinations. For more information and resources on adult immunization, visit the CDC’s Adult Vaccination Resource Page.